The Five Oaks area of Sevierville has long been known for being a fantastic outlet mall destination. But did you know it&apos;s also a great place to visit for families in search of fun times in the great outdoors? That&apos;s exactly what you&apos;ll find if you check out everything they have to offer at Five Oaks Adventure Park, located on the Parkway in Sevierville, not far from the Tanger Outlet center, at traffic marker number 13.1. Located on 70 wooded acres, the Adventure Park helps its guests get back in touch with nature and have a blast in the process. You might start off on their Tree Tops ropes course, which is great for team-building exercises as well as family bonding time. There are two courses that offer different experiences, but in both cases, guests are always securely harnessed to safety cables, and guides are always nearby for assistance, if needed. 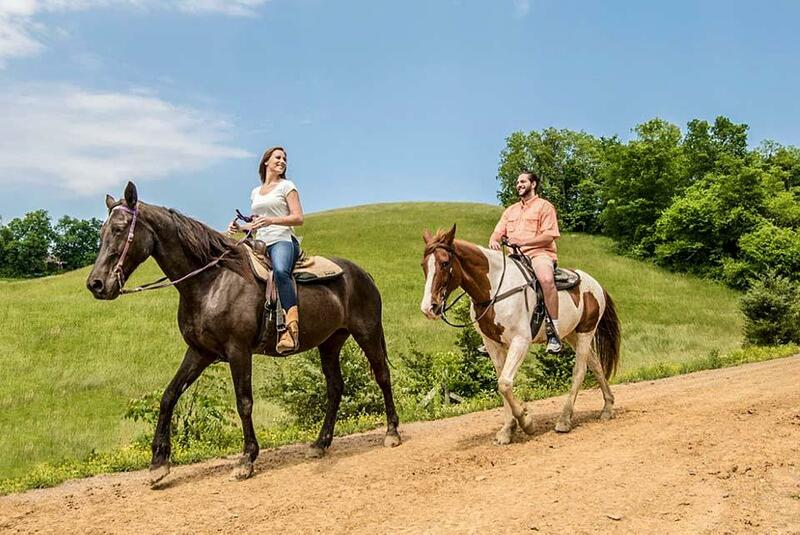 If horseback riding is your thing, you can navigate wooded trails that meander throughout the nature park&apos;s acreage and deliver gorgeous majestic views of a mountain lake as well as Mt. LeConte. Or maybe you&apos;ll want to try your hand at ziplining. The zipline course at Adventure Park has lines that range from 450 to 2,000 feet and allow just about anybody to fly through the air, among the treetops, at speeds of up to 50 miles per hour. You can even zipline with them at night! If your Smoky Mountain travels have you visiting us in Gatlinburg, you can work this trip to Sevierville in with no problem. You can park for the day in one of our many different downtown Gatlinburg lots and then take the Gatlinburg and Pigeon Forge trolley systems to Sevierville and back. The Pigeon Forge trolley, for example, goes as far as the Governor&apos;s Crossing development, which is adjacent to Five Oaks Adventure Park. It&apos;s a great arrangement all around. Someone else gets to do all the driving, and you&apos;ll find that our daily rates are right on par with those at the Gatlinburg parking garage rates. And we have locations all over town, making it easy for you to park near all the things you&apos;re interested in doing while you&apos;re in downtown Gatlinburg.